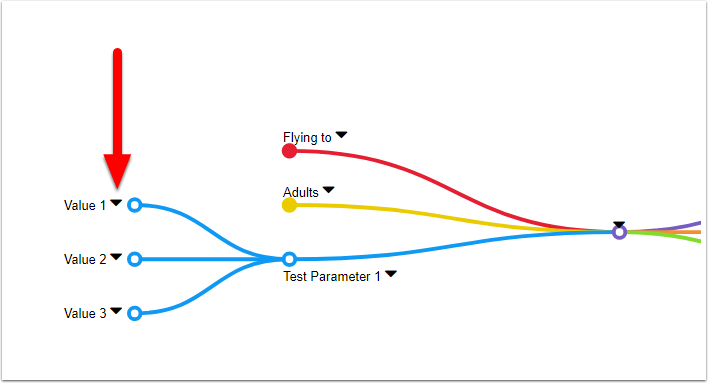 Hexawise has developed an exciting new feature that allows users to easily create and edit their plan’s parameters and values inside a mind map. These editable mind map are especially useful because they allow the user to easily add parameters and values while viewing the plan in the clear, logical, and visual format of the map. They are also a great way to quickly and clearly communicate the most information to stakeholders about what kinds of testing ideas you thought to include. Let’s take a look. Where are the editable mind maps located? Once inside a plan, look above your parameters for the "Mind Map” button highlighted in the screenshot below. Click on it to display the mind map variant of your inputs. 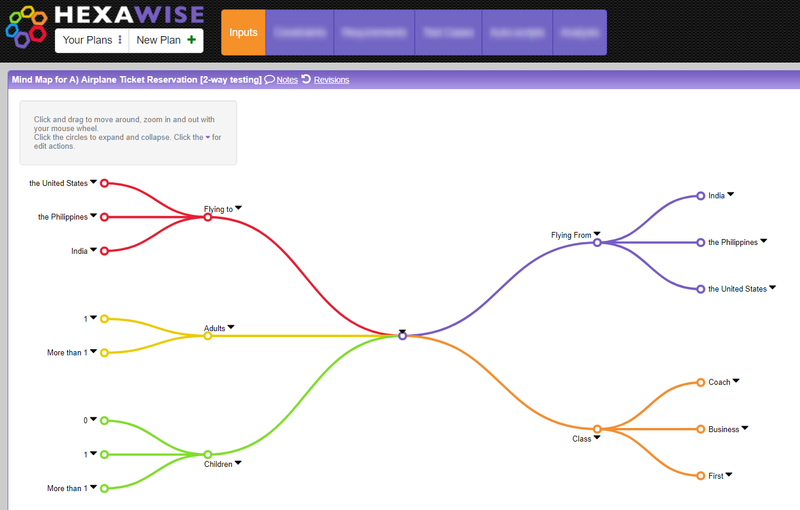 Clicking on the mind map button takes you to the following screen, where you can now view and edit your plan in Hexawise's mind map format. To adjust your view of the mind map, simply click and drag within the window. 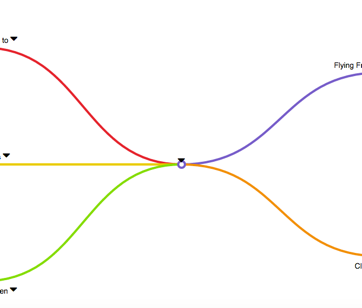 You can also zoom in and out of the mind map by scrolling your mouse wheel forward and backward. If you want to expand or collapse a parameter’s values, click the open circle by the parameter’s name. Here’s where the fun starts! You can now create and edit parameters and parameter values directly from the mind map. To add a parameter, click the circle in the very middle of the mind map as shown below. Let’s add a parameter titled “Test Parameter 1” to the mind map by typing the parameter name into the above window. After clicking “Add Parameters” the parameter will populate the mind map as shown below (notice that I also collapsed the parameter values for all other parameters). Now that we have a new parameter in the mind map, let’s add some values to it. First click on the downward facing arrow by the parameter name, which displays the menu shown below. Click “Add Parameter Values” which brings up a similar menu to the one for adding the parameters. You can also rename or delete the parameter from this menu. Let's enter “Value 1”, and click "Add Parameter Values." You can also add multiple parameter values at the same time by entering the value names separated by commas (e.g. "Value 1, Value 2, Value 3"). Once you click the “Add Parameter Values” button, the parameter values appear in the mind map next to the parameter we created earlier. Don’t forget to hit the “Save” button in the upper right corner to save the changes to your plan! The last feature we will cover here is the ability to add Value Expansions to parameter values inside the editable mind map. If you are unfamiliar with value expansions please check out this help file. To access this feature, click the downward facing arrow next to the newly created parameter values. 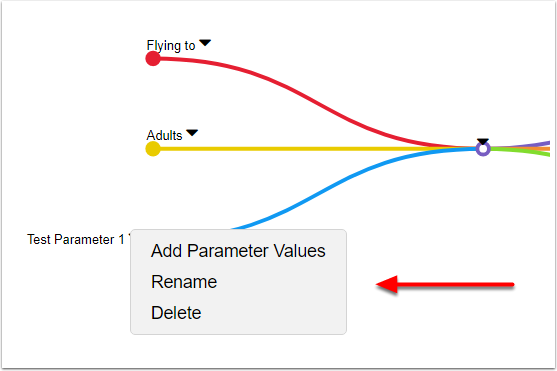 Clicking the arrow brings up another menu that allows you to add value expansions, rename the parameter value, or delete the parameter value. Let's choose the "Add Value Expansions” option, enter the three values “Expansion 1, Expansion 2, Expansion 3”, and click “Add Value Expansions” to add them to the mind map. Remember to save your changes!